So, I’m in love with the cookie cake AND the basket. Is that ok? Am I cheating on one to love the other. Probably not, since they’re a package deal. Heh. Anyway, I think this is the PERFECT basket for a centerpiece or an office-party (I’ll be using it for a centerpiece). It’s large, since it’s a diaper box, but not overly so, so it’ll work for pretty much any purpose. And, the best part? 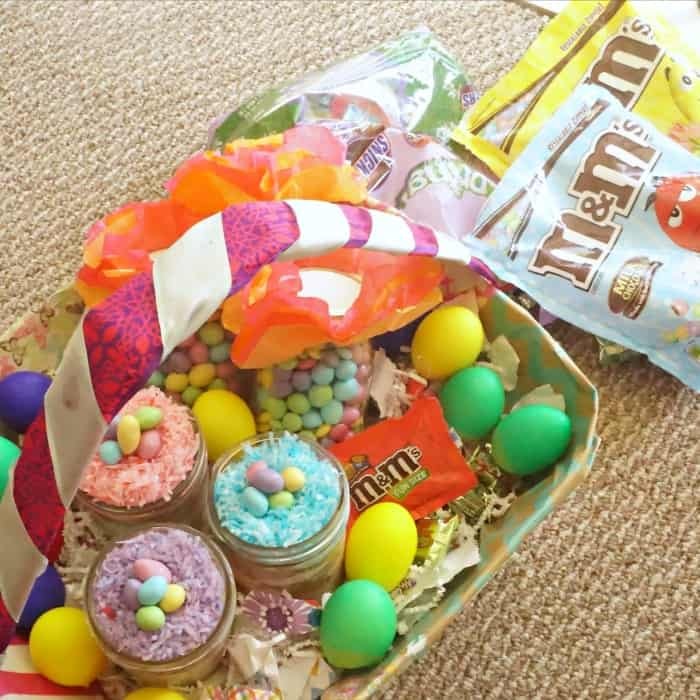 It’s filled with the world’s favorite candies (well, the Easter-ey version of them), M&M’s® Pastel M&M’s® Pastel Peanut, and MARS Spring Minis Mix. See? In love. I was able to snag everything I needed (that I didn’t already have at home) at Sam’s Club one afternoon on the way to my mom’s house for Sunday supper. 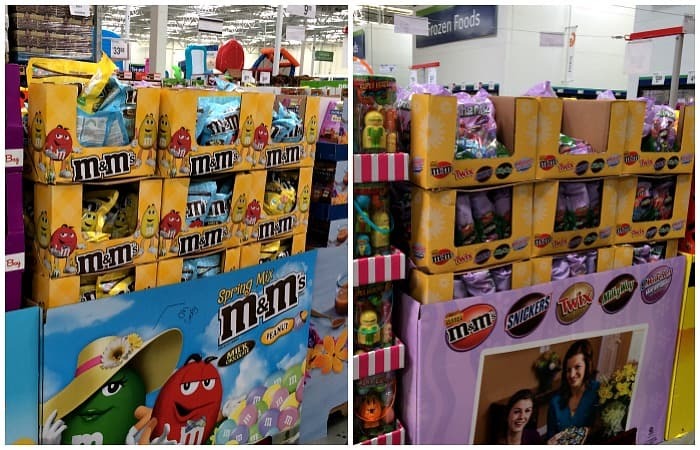 Conveniently, the M&M’s® Pastel M&M’s® Pastel Peanut, and MARS Spring Minis Mix display was right next to the ribbons…and not far from the diapers…so I was able to get it all in one fell swoop. All except for the scrapbook paper and decoupage glue, which I have a healthy stock of at home, anyway, so I didn’t even look. LOL! 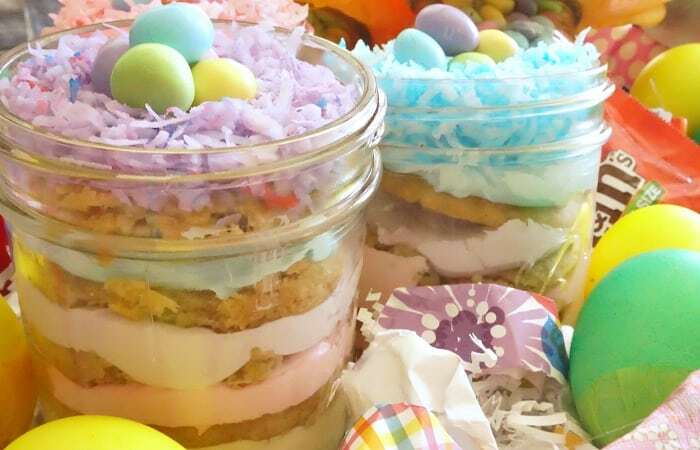 Sweet sugar cookies with decadent M&M's® Pastel throughout, icing then topped with coconut and M&M's® Pastel Peanut...all inside a jar. Blend butter and sugars together. Beat in vanilla, water and aquafaba (or egg). In a separate bowl, mix together the remaining ingredients for the cookies, except for the M&M's® Pastel. Add this second set of ingredients to the first in 1/3 increments. Mix until all ingredients are combined thoroughly. Gently stir-in the M&M's® Pastel. Form small balls and place on a lined cookie sheet. Bake in the oven for 10-12 minutes until just before cookies brown. Remove cookies from the oven and allow to cool for at least 10 minutes. While the cookies are cooling, equally separate the frosting into 6 different bowls. Add one to two drops of each food color to a bowl of frosting. Mix each frosting thoroughly until the food coloring is consistent throughout. Set aside. Separate the coconut into 3 baggies. Add one to two drops of pink, blue and purple food coloring to a baggie. Shake until the coconut is colored consistently. Place a layer of one color of frosting in the bottom of a jar, add a cookie. 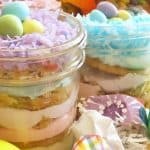 Keep layering each color frosting and a cookie until you fill the jar. 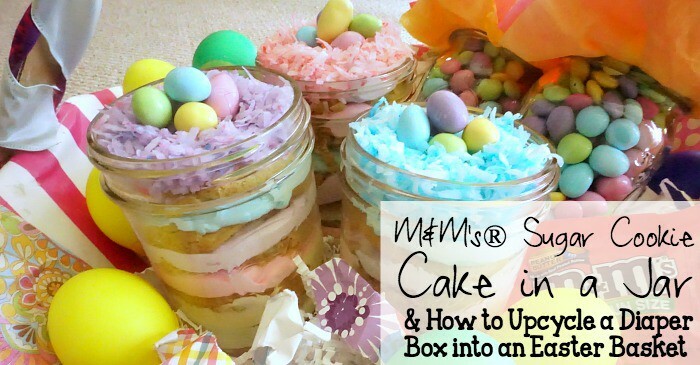 Place another layer of frosting on top, then one color of the coconut, then top with some M&M's® Pastel Peanut, for fun. Cut the flaps off one end. Cut the box about halfway down the side at each corner and fold the new “flaps” outward. Hot glue the original flaps to the corners, forcing it open like a bowl. Trim the corners so the edge is round like a bowl (see what we’re doing here?). Decoupage some pretty Easter-ey scrapbook paper all over, inside and out. Cut 2 strips of cardboard about 2-inches wide and about 1 foot long. Hot glue one end of each of those strips to the basket. Then hot glue their ends together to form a handle. Hot glue some ribbon over that handle. So, what do you think? 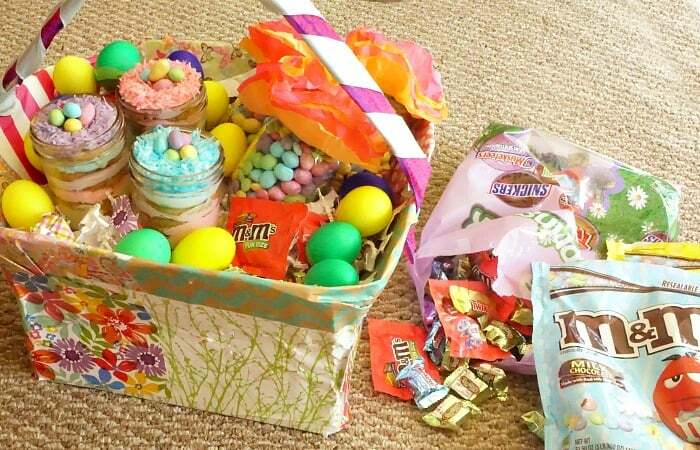 Will you be embarking on a little DIY fun to make your own Easter basket from a box? Hit me up with a picture of how your’s turns out! 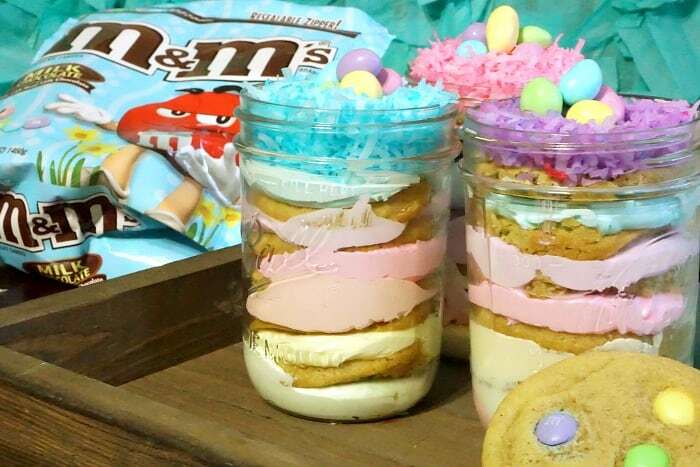 And don’t forget to make your M&M’s® Sugar Cookie Cake in a Jar with M&M’s® Pastel M&M’s® Pastel Peanut, and MARS Spring Minis Mix. Makes that Easter basket so much fun.